​How to Improve Your Scores at Training Level Dressage. Sandra had good reason to believe she was a good rider. She'd been riding since she was a child. Every weekend, she and her big grey mare went on long trail rides with friends, and everyone had a ball. So why, she thought ruefully, are my dressage training level scores so low? 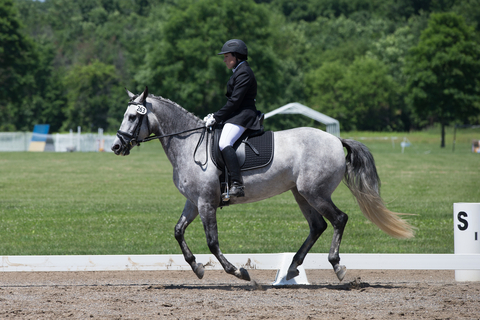 Riders of all levels who begin dressage training need to understand one big thing: Dressage is about your horse's fitness, strength, agility, strength, and cooperativeness. It is your horse that is being judged on these terms. The feedback the judge gives you tells you where your horse needs improvement. Sometimes they read like unfair criticisms. But a quality judge's comments are gold nuggets of information about where and how your horse's fitness should improve in order to keep her sound and happy. ​The secret: Training level riders typically lose points for lack of quality in halts, circles, corners, and free walk. As I described in this article, horses start life "crooked", that is, bent more toward one side than the other, and they carry about 70% of their weight on their forehand. A horse that carries a rider this way for most of her life will end up with a sway back, weak haunches, and muscle soreness. Think of dressage as a fitness regimen for your horse, a kind of horsey aerobics, yoga, and pilates all rolled into one. Your job is to straighten your horse, build her top line, shift her weight back onto her haunches, and teach her to go forward with rhythm and balance. You start your horse on this regimen at Training Level. The goal of training level is to teach your horse to be supple and to move freely forward in a clear rhythm with a steady tempo while accepting contact with your hands through the bit. And to do that, her training is all about those corners and circles, with that all-important free walk and halt thrown in for good measure. Let's start by taking a look at what a good Training Level Test looks like. I chose a YouTube video that shows a beautiful horse-and rider pair in perfect harmony. The first thing you'll notice is that the horse is NOT a big warmblood who was bred for flashy dressage movement and is being shown two levels below the level at which is is currently being trained. No, this is a legitimate Training Level pair riding a lovely test. Notice how comfortably and freely the horse goes forward, how responsive he is to the rider's aids, and how much the ride is in tune with her horse's movement. Notice also how well muscled and flexible the horse is. The right dressage training will do that for any breed. ​The most important thing: Straightness and quality. Your horse should walk or trot on a straight line, and halt straight and square. If your horse weaves, fidgets, or falls apart at halt, you will lose points. The “invisible” letters X or G should lie between your horse’s shoulder and your leg. If you mentally plan to halt when your horse’s shoulder (or hooves) land on X or G, you should be in the proper place once the halt is completed. It’s OK to walk into and out of the halt. At this level, it is also OK if the halt isn't perfectly square. The horse in the video "hangs" his hind. CIRCLES, CORNERS, AND DIAGONALS: Dressage tests at training level all build upon a 20 meter circle But training level riders often have no idea what a 20 meter circle actually looks or feels like. A full arena is comprised of 3 twenty-meter circles, and a small dressage arena is comprised of 2 twenty-meter circles. The problem is that the letters don’t mark these off. So riders can get ensnared by visual illusions that cause them ride ovals instead of circles. You will lose points if your circles aren’t geometrically correct. Why? Because it takes skill to keep a horse moving rhythmically and evenly on a circle. So you need to visualize these circles when you look at the dressage arena in order to ride them well. If you're guessing, you will make constant little adjustments that interfere with your horse's flow of movement. Many dressage riders think the most important thing about the free walk is how low the horse drops his head. But that isn’t what the judge is looking for. She’s looking for how much ground the horse covers in his strides, how rhythmic the walk is, how much activity there is in the walk, and how relaxed the horse is. This movement was introduced because dressage riders we so focused on getting their horses to shorten their frames that they were ruining their horse's naturally free and flowing walk. This movements asks the horse to show how free and comfortable he feels when moving. When you release your reins for free walk, your horse should stretch his neck out and down, and his body should move freely from haunches to nose. If you watch from behind, he should look a little like Marilyn Monroe sashaying down a runway. If your horse shows tension or stiffness, you will lose points because it indicates that your horse training is creating stiffness when it should be creating suppleness. To set up the free walk, make sure you go deep into the corner so that your horse is straight as he starts on the diagonal, immediately release the reins to as light a contact as possible, then don’t take up the reins again until the horse’s nose reaches the next letter. You will have plenty of time to re-establish contact, connection, and forward impulsion before your next figure. Don't overlook the important of the free walk when working on dressage tests training level. This movement shows that the horse accepts contact, no matter how light it is, and can maintain her balance and rhythm on a circle without the rider having to "take every step for her". The horse should stretch through her back neck, stretching forward and downward into a light contact. The horse should be able to easily maintain balance, trot rhythm and quality, bend in the body, and (therefore) the correct size and shaped circle. The best way to train "chew out" is to develop an elastic "feeling" rein contact so that when you open your fingers to release the reins (or push your hands forward), the horse should reach out and down in an attempt to re-establish contact with your hands. When your horse does that, she is telling you she likes your contact and is willing to accept it. With this foundation in place, you can work wonders. More on how to develop an elastic contact here. The 2015 USEF Dressage Tests can be found here.